Boston’s Chinatown is home to the third largest Chinese community in the U.S. and on Friday, February 16, the city will welcome the Year of the Dog. 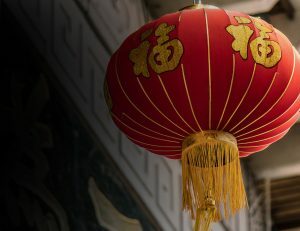 While the first few days of the New Year are typically celebrated within the immediate family, there will be plenty of festivities for you to checkout just minutes away in Chinatown. Firecrackers, beating drums, gongs, and crashing symbols will drive away evil spirits as colorful lion dancers and martial arts demonstrations fill the streets of Chinatown from 10 a.m. to 5 p.m. on Sunday, February 25. The beautiful lion costumes reflect the style of Southern Lions from Guangdong Province in Southern China, home of the Cantonese people who first settled in Boston in the mid-1870s. Watch as each lion group performs its own dance routine to express emotions including joy, curiosity, respect, anger, contentment, and playfulness. Local businesses decorate storefronts with hanging red paper lanterns, which symbolize good luck and prosperity. On the day of the parade, these businesses also place oranges and cabbages outside as an offering to the lions. When the owners “feed” the lions, they bow three times in gratitude and toss the oranges into the air (Try your best to catch one to have great luck throughout the year!). Then, the lions will smash the cabbages on the ground, spreading good fortune among the crowd. Finally, the parade will end with firecrackers to scare away any evil spirits and start the year fresh. Enjoy special performances, snacks, calligraphy, dance, music, origami, and more at the Cultural Villages located in the China Trade Center and at 90 Tyler Street. Both locations are free and offer a different mix of family-friendly activities. There’s no doubt that your stomach will be talking to you once the day is done. Fortunately, Chinatown is full of excellent restaurants. Enjoy dim sum at our favorite Winsor Dim Sum Cafe (located on Tyler Street). Step into the no-frills space and place your order by checking off different bites from a paper list. Grab a table or take it to go… you won’t be disappointed. Looking for something a bit more contemporary? “Boston Discovery Guide” recommends these five restaurants. Those born in the Year of the Dog (1922, 1934, 1946, 1958, 1970, 1982, 1994, 2006 and 2018) are said to be honest, friendly, faithful, loyal, and smart. To learn more about the Dog and other Chinese zodiac animals, CLICK HERE.